Today’s post is to remind you of our new Stamp or Die Cut challenge. The PCW design team is hosting a bi-weekly challenge using either stamps (digital or regular) and or a die cut. The die cut can be from ANY source and does not have to be Cricut. It can be from your Spellbinders, Sizzix, Lifestyle (Quickutz) or from your Pazzles, Gazelle, Cameo or even from your punches! This is about showcasing the wonderful digital stamps and die cuts. So here are a couple of projects using the current FREE files and to go along with our Welcome Baby Theme. Designer Evelyn is hosting this challenge, so be sure to visit her blog and thank her for the wonderful inspiration. FIRST: HERE is the Challenge Post where you can see what the designers showcased last week AND this is also where you can grab the FREE files AND enter. 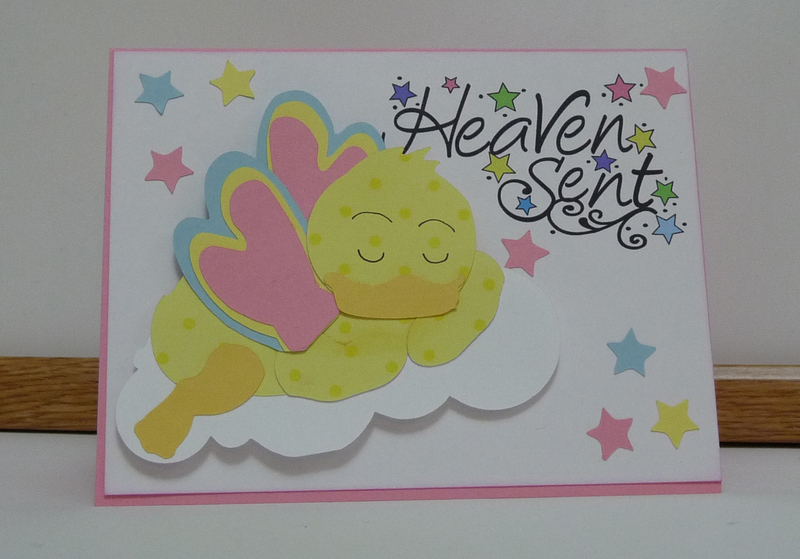 Evelyn created this super adorable card using the FREE heaven sent digi AND the wings from the FREE Butterfly file. She also paired it with the Baby Duckies Cutting File from PCW. Be sure to visit Evelyn’s Direct Post HERE for the details on HOW she put these sweet card together. Melinda created this adorable layout using the Baby Set 5 elephant and booties from PCW and the FREE Butterfly n’ Flourish Cutting file (see below). Here is the complete layout. I created this layout using the NEW Quick Quotes Paper and embellishment line called: One Fine Day. It is GORGEOUS!!! The double sided cardstock weight paper patterns are DYNAMITE! They are so versatile. I used it for a baby layout, but wait until you see what else it is great for!!! Close up of the layered butterfly and the baby booties. Close up of the adorable little elephant from Set 5. Now for a little extra incentive to join the fun! Buy any two of these sets and receive a third set FREE! PCWBaby and your third set will be FREE! Wonderful Wednesday Cooking With Cricut Challenge! What an exquisite layout, Melin! I love the soft colors.